If I had paid more attention to Warren Buffett's lessons, I might have avoided 1 disastrous investment. As Bruce Springsteen remarks in his hit song "Glory Days", most people like to reminisce on their past successes. That certainly holds true in the investing world -- it's not hard to get someone to tell you about their best stock pick ever. However, if you're looking to improve, it's a lot more useful to study your mistakes: a point emphasized by Berkshire Hathaway (NYSE:BRK-A) (NYSE:BRK-B) Vice-Chairman Charlie Munger. Accordingly, today I'm going to take a look at my biggest investing mistake ever. In 2007, in search of juicy dividends, I decided to invest in a bank. But I didn't pick Wells Fargo (NYSE:WFC), a longtime Buffett favorite that is currently Berkshire Hathaway's largest investment. Instead, I bought 100 shares of Washington Mutual. 16 months later, WaMu was seized by federal regulators and sold off for a pittance -- taking a big chunk of my savings with it. Before getting into the gory details of my ill-fated investment, let's take a moment to consider why it's so important to study your mistakes. As Buffett explained in the above quotation, once you figure out where you don't want to go, you can make sure you don't go there. This means that you need to know more than just that you invested in a certain company and its stock price went down. Sometimes, poor investment performance can be the result of bad luck -- for example, a promising product turns out to be a bust. As a result, some mistakes may be unavoidable. To truly learn from your investing mistakes, you need to understand both why you made the poor investment decision and whether you should have -- or could have -- known better at the time. The reason why Munger and Buffett study mistakes is that once they understand the "whys" behind their mistakes, they are in a better position to change their behavior. This is a big reason why Berkshire Hathaway has been able to generate outsized returns for decades. 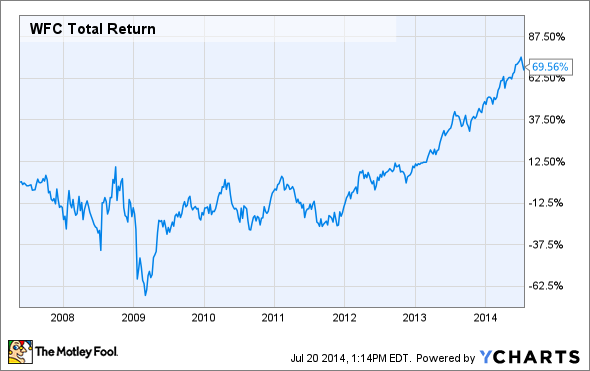 When I put some money into Washington Mutual stock in 2007, I was still an investing novice. I had been exposed to some basic lessons, such as the importance of being patient and the famous Warren Buffett aphorism: "Be fearful when other are greedy and be greedy only when others are fearful." However, I had not learned all of the important lessons for becoming a successful investor, and I certainly hadn't internalized them. For example, I focused too heavily on P/E ratios and Wall Street analysts' estimates when making investing decisions. In early 2007, Washington Mutual was trading for 11.6 times earnings, whereas Wells Fargo was trading for 14.2 times earnings. WaMu also had a juicy 5% dividend yield, whereas Wells Fargo's dividend was closer to 3%. If I had been a better Buffett disciple, I would have recognized that Wells Fargo was by far the better bet despite its premium price. Wells Fargo was extremely well-managed and maintained a conservative approach to risk-management. However, I was swayed by the (apparent) bargain price and high yield of WaMu shares. My confidence was buoyed by the fact that Washington Mutual CEO Kerry Killinger wasn't too worried about the company's deteriorating results. Killinger told investors on the company's October 2007 earnings call that WaMu was committed to maintaining its $0.56 quarterly dividend. (It lasted less than 2 months.) However, I assumed that the CEO must know what was going on more than second-guessers outside the company. There was one key theme to my disastrous investment in Washington Mutual. I relied heavily on what other people were saying. When the CEO and bullish analysts told me not to worry, I was happy to take the long view (which actually meant burying my head in the sand). In fact, I didn't know much about the banking business. It never occurred to me that a company with a $60 billion+ market cap could go bust in just 1 year. The crux of the problem was that I ignored one of Buffett's most important lessons: buy what you know. As an individual investor, it's OK to not understand how businesses in each sector of the market make money. However, that doesn't make it OK to invest in companies you don't understand! There are plenty of good index funds that can give you exposure to the broader market, giving you diversification without undue risk. If you're going to risk your money on a single company's prospects, it's important to understand how its business works: just knowing its P/E ratio won't cut it. My key mistake was not picking the wrong horse in the banking sector -- although Wells Fargo has provided a total return of 70% since May, 2007 -- it was investing in a business I didn't understand whatsoever. I walked into the biggest investing mistake of my life by ignoring one of Buffett's most important lessons: buy companies whose business models you understand. I thought I was being clever by being greedy when others were being fearful. However, I didn't know enough about the banking business to have a clue about when to be greedy and when to be fearful. There's absolutely nothing wrong with investing most or all of your money in index funds. If you're going to risk your hard earned money on a single stock instead, don't just do it on somebody else's say-so -- make sure you understand what you're buying. Warren Buffett could have saved me a boatload of money. He could do the same for you.